Handles offered in brass or chrome. Finish options are black matte or polished silver. Designed to fit on fireplace inserts. Get Condar contact information plus see product stories we've published about the company. Wood stoves reduce both heating bills and humidity levels in your home. 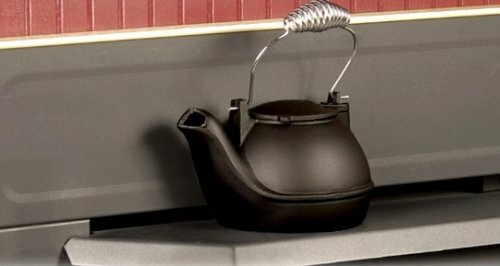 Restore the humidity with this two-quart half-kettle. Designed to fit atop the narrow ledges of wood stove inserts, it's a scant four-inches wide. It may look like it's talking out of one side of its mouth, but that's by design. The skewed spout directs steam toward your living space. The hand-cast aluminum kettle is designed and made in America.